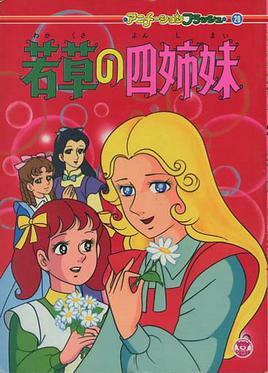 The March sisters as they appear in the show. Clockwise from lower right: Jo, Amy, Beth, and Meg. Little Women, also known as Little Women's Four Sisters (若草の四姉妹 Wakakusa no Yon Shimai) or From "Little Women Story": Little Women's Four Sisters (「若草物語」より 若草の四姉妹 "Wakakusa Monogatari" Yori: Wakakusa no Yon Shimai), is a 1981 Japanese animated television series adaptation of Louisa May Alcott's Little Women. The series is directed by Kazuya Miyazaki (a veteran Toei director whose credits included Cutie Honey and UFO Robo Grendizer among others) and produced by Toei Animation for the Kokusai Eiga-sha (Movie International) company. This series was a follow-up to the TV special that aired the previous year by the same animation studio, which was also dubbed into English by HarmonyGold, but this series does include a more refined art style. This series is sometimes confused with Nippon Animation's 1987 World Masterpiece Theater TV series Tales of Little Women, as both series were dubbed in English and broadcast on U.S. cable TV in the 1980s (the 1981 series on CBN, now known as Freeform, and the 1987 series on HBO, currently streaming on AmazonPrime). Not helping is that both TV series share two voice actresses: Keiko Han, who plays Beth in this TV series and Meg in the 1987 series, and Taeko Nakanishi, who voices the Narrator here and Marmee in the 1987 anime. The series follows the original story rather faithfully. However there are some differneces. The most glaring example for fans of the book are Jo and Amy's hair colors, as you can see in the page picture. There are also some plots added, for example in episode 13, A Group of Refugees, the March family helps a family of runaway slaves escape Confederate soldiers, and in episode 18, The Field Hospital Raised in Town, the girls and their mother volunteer at a hospital and Laurie ends up getting caught in a battle's crossfire, getting injured. Also some episodes are based on plot-points only breifly mentioned in the novel, such as episode 17, Aunt March Chooses a Foster Daughter, where Aunt March talks to Marmee about adopting one of the girls, and episode 14, Beth and the Canary, The family deals with the death of a pet bird, Pipin, and Beth taking it especially hard. There are even two episodes that focus on Jo's stories, Jo's Fantasy and Jo's Fantasy 2. The series was said to do well enough in ratings, and the complete series was released on VHS, but has yet to receive a proper DVD release in it's native Japan, though it has had a DVD release in France and Taiwan (the latter being a bootleg set). There are Japanese clips online in varying quality, as well as the complete series being available in French and Italian on Youtube. According to Wikipedia, the original master tapes were damaged which prevented a DVD release, though this is an un-cited statement. The English dub is also mostly lost, aside from the first three episodes, which have been uploaded by 20C History Project due to them finding VHS tapes at a thrift store. It is unknown if any other episodes were released on VHS at this time. The series was licensed in the US by Enoki Films and is still on their Japanese website, but the company's US branch went defunct in 2010, so a modern-day release is unlikely. UPDATE As of April 15, All 26 episodes in Japanese have been uploaded by YouTube user Vivanni Loyd , having owned VHS rips for quite a while, albeit without subtitles. Episode 1 in French. Note the higher quality.